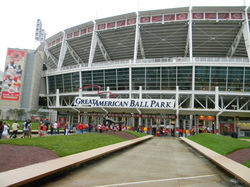 Located on the banks of the Ohio River is Great American Ball Park. The Ballpark opened in 2003 and replaced Cinergy Field. The stadium holds 42,319 fans. The original construction cost was 290 million dollars. The main entrance has the Great American Ballpark sign out in front. 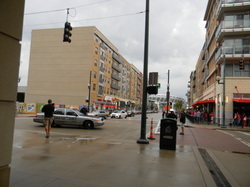 Located in front of the sign is the Crosley Terrace. 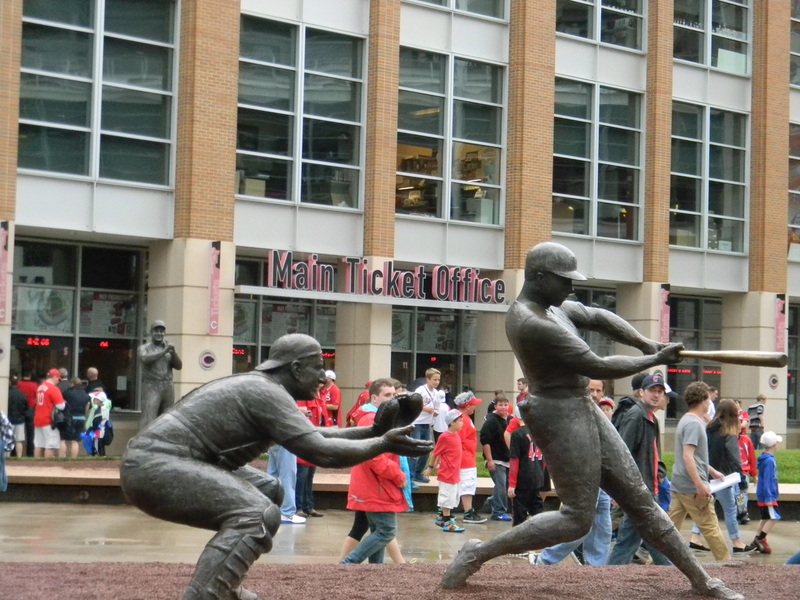 Several Reds legends statues are located here including Ernie Lombardi, Ted Kluszewski, Frank Robinson and Joe Nuxhall. Around the third baseline you'll see the Reds office building. Here you will find the "Spirit of Baseball" on the brick. To the right of the stadium stands the Reds Hall of Fame. A statue of Johnny Bench can be found outside of the Hall of Fame. The concourse on the lower level has several options for team gear, but the main team shop is located by section 108. In the right hand corner of the stadium you'll find the Fan Zone. A stage is setup for concerts, a small baseball field, a playground and much more can be found in the Fan Zone. A great selection of beers can be found outside of section 115. A lot of local food options can be located throughout the stadium such as UDF and Skyline. The upper concourse has three places for Reds apparel. The upper level doesn't get left out in the local food department. They have a LaRosa's, the local pizza of Cincinnati. 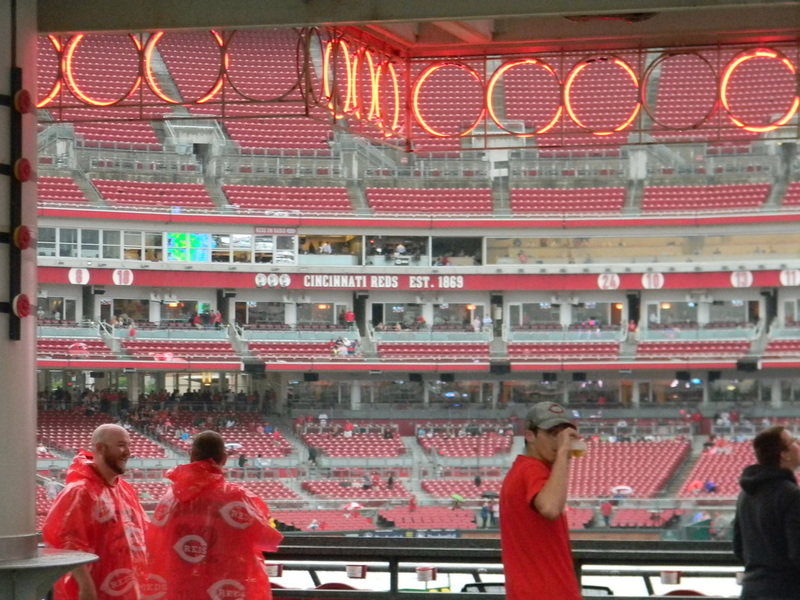 The seating at Great American Ballpark are mostly chairback seating except for the bleacher seating in left field. The seats are red all around the stadium. Starting in right field we have the Moon Deck/Sun Deck. This section goes as high as 28 rows and as low as seven rows. Behind sections 145-146 you will see the Power Stacks. The stacks play a part of the gameday experience with fire coming out on a strikeout and fireworks coming out on a Reds home run. The batters eye includes the Riverboat Deck. This area includes all you can eat food and drink. The deck holds up to 150 people. 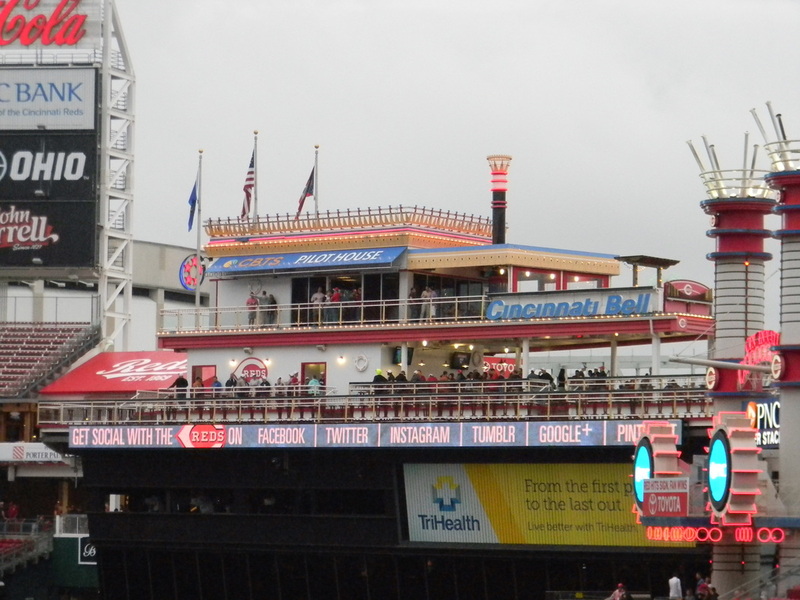 Right below the Riverboat Deck is the Cincinnati Bell Technology Pavilion. In left field we have the bleacher seating. The bleachers sit atop the Terrace Outfield seats and sit under the scoreboard. The seats have red backs and traditional silver bleacher seating. The Terrace Outfield provides 16 rows of seating in six sections. The third baseline seating has three levels. In the lower level you have Field Box seating and Infield Box. As you go up a level you'll find the All-You-Can-Eat seats, Outer Mezzanine and Mezzanine seats. The upper deck has four different types of seating. The furthest away from the action is the Value View seats in section 509. The next sections of seats are Outer View Level, View Level Line and View Level. The gap between the seats down the third base line and behind home plate is called "The Gap". Several seating options are available behind home plate. Starting at the top and working our way down are more View Level seats, right below the View Level seats on the same tier are the View Level Box seats. The Club Home seats are located right below the suites. In the lower level they have Scout seating, Scout Box and Diamond Seats. The first baseline seating includes more View Level seats in the upper deck. Two other sections are on that level, View Level Line and Outer View Level. The View Level Box is directly below each section in the upper tier seating. A level down is more Club Level seating. Starting from the furthest away from home plate in the lower level is Terrace Line. Next is the Field Box seating and then Infield Box. 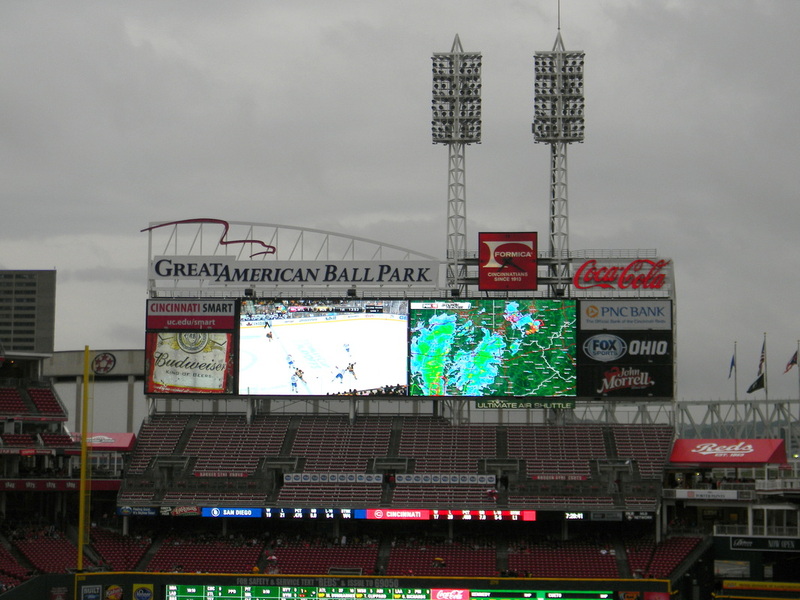 The scoreboard at Great American Ballpark sits above the bleachers in left field. The scoreboard was upgraded for the 2009 season. The scoreboard is nearly 218 feet wide. On top of the scoreboard, they have "Great American Ballpark". The stadium has several patios, clubs and suites to choose from. Over 4,235 club suites and 63 suites. For a list of all the deck seating and suites check out the list here, Reds Suites and Decks. For a virtual view of your seats check out this seating chart. Riverboat Deck at Great American Ballpark. The Banks located next to GABP. #1 If you're looking for parking, try the parking garage by the stadium located off of Mehiring Way. #2 Find a spot to grab something to eat. A popular spot for Reds fans is, Holy Grail in "The Banks". #3 Check out Fountain Square and get a scoop of Graeter's ice cream. #4 If you have time, the Reds Hall of Fame is located at the stadium. #5 Head to Great American Ballpark! Great American Ballpark: This ballpark has changed a lot since it's debut in 2003. I can remember not being to impressed with the stadium the first time I went to a game that year (of course it was a massive upgrade over Cinergy). The ballpark now is full of new seating options, the Steamboat Deck is really cool. Even a recent addition of "The Banks" brings a new energy around the ballpark. I love all the local flavors in the ballpark, maybe I love them because I grew up with the food, but at any park it's nice to try the local flavor. I've been back and forth on if I like the view of the river or would more of the Skyline be a better backdrop. Like many things that have gotten better since 2003, the river backdrop has improved with the growth of Newport. Big thanks to Tim Parks for the seats! If you haven't picked up a MLB Pass-port, get one here! They have several different options from MLB to MiLB passports. It's a good way to keep track of the games you've been to and the memories you had at the ballpark. 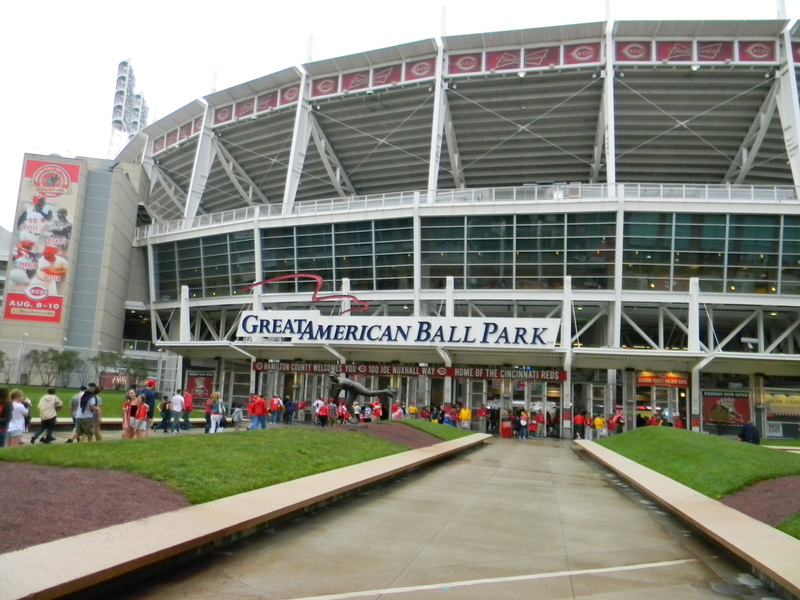 Cincinnati: Located on the Ohio River, Cincinnati is home to the first professional baseball team the Cincinnati Reds. Plenty of things to do in Cincinnati from great food to the casino. If you're looking for food start with local favorites like Skyline Chili, LaRosa's Pizza, Montgomery Inn and Graeter's Ice Cream. I'm a huge fan of Cincinnati Chili. A few other places to grab the local chili are Gold Star, Chili Time and Camp Washington. The Chili is famous for the use of chocolate and Cinnamon. Grab a coney or a three-way (chili, cheese and spaghetti). If you don't have time to go to Montgomery at least grab some BBQ sauce at a local grocery store. As for things to do in the city. Fountain Square has several hotels, restaurants and shops around it. Also, grab a picture in front of the Tyler Davidson Fountain. One of the newest additions to the city, the Horseshoe Casino, will keep you entertained. Having several restaurants, concerts and bars. A cool section of the city is the OTR Brewery district. The district boasts plenty of beer from local breweries. It also has the oldest farmers market in the state. I wasn't able to make it to the district on my visit, but i got a lot of recommendations to check it out and I will on my next visit. Across the river is Newport, Kentucky. This is a hot spot for many tourists. The two most popular spots are the Newport Aquarium and Newport on the Levee. The aquarium cost 23 dollars for anyone 13 and older, 15 dollars for ages 2-12 and under 2 free. One cool animal you can see at the aquarium is the shark ray, they have four of them. Right next to the aquarium is Newport on the Levee. The levee is packed with plenty of shops, restaurants and entertainment. Scoreboard: Before the upgrade in 2009 the scoreboard was pretty sad, the new upgrade brought a HD screen and that changed everything. The name of the ballpark on top of the scoreboard is a nice touch. The ballpark also has ribbon scoreboards in different areas of the stadium. Atmosphere: The game I went to got rained out. It's hard to give an accurate rating, but I have been to previous games at GABP and they have provided good atmospheres. 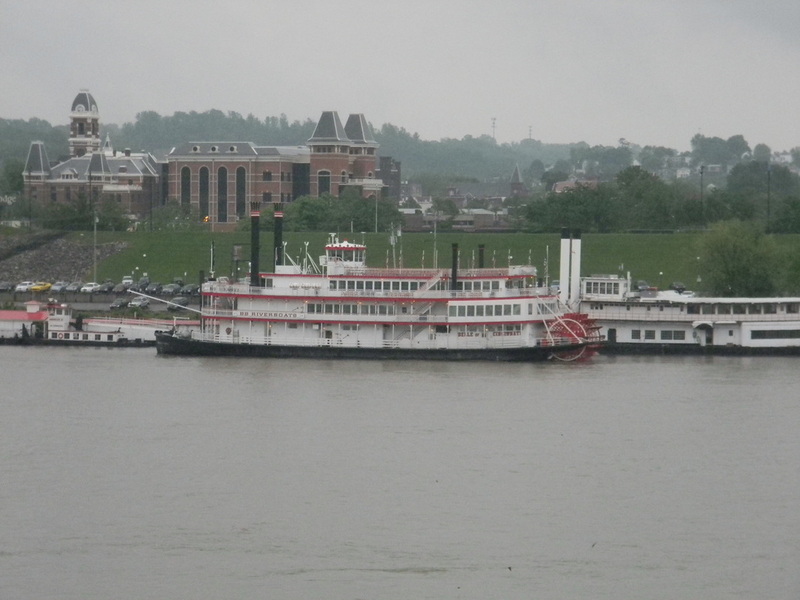 Riverboat on the Ohio River. What's Your Rating For GABP?